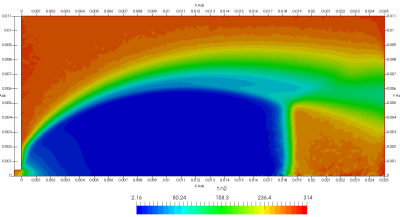 Starfish is a two-dimensional gas and plasma simulation code. It implements the Electrostatic Particle in Cell (ES-PIC) method to model plasmas, as well as several fluid solvers for continuum problems. Surface geometry is represented by linear and/or cubic spline segments. The computational domain is discretized into a rectilinear or body-fitted mesh. Multiple gas injection sources are available, and a detailed surface handler is also implemented. The species interact with each other via collisions (MCC or DSCM) or by chemical reactions. There are two versions. 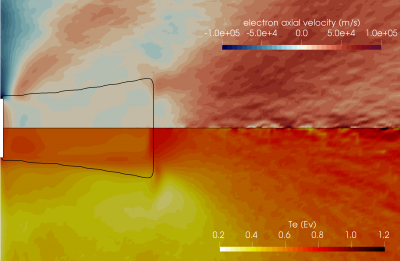 The open source Starfish contains basic support for plasma modeling via the Electrostatic Particle In Cell (ES-PIC) method with MCC or DSMC. It also supports free molecular flow, and contains diffusion-advection fluid solver. It is available as a free download from this site. The source code is available on Github. 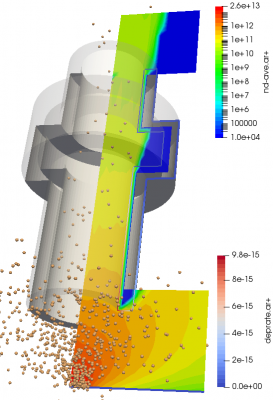 The full version extends the basic version by including additional particle source models, detailed surface treatment, and Navier Stokes solver. It also contains special module for modeling electric propulsion devices. The full version is currently not available for general distribution and is used internally in support of our contracts. Sign up for the newsletter to receive code release updates. Do not hesitate to contact us if there are specific features of interest, or if you would like to collaborate by adding solvers. Plasma sheath near a rough wall. Figure from Laura Rose thesis. DSMC simulation of an atmospheric jet expanding to a low pressure tank. 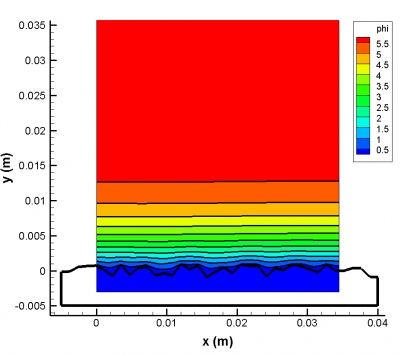 This plot shows the gas temperature. Starfish is a Java program, and as such, you will need to have the Java Runtime Environment installed. Starfish currently runs in command-line mode only. Navigate to the folder containing your input files and use the syntax below to launch the simulation. The simulation progresses according to commands specified in the starfish.xml located in the current directory. A GUI is on the short-list of things to work on in the near future. The last Starfish seminar wast held Thursday January 25th, 2018. Information about upcoming seminars will be posted here. You can obtain Starfish one of two ways. The easiest is to download the binary .jar file using the form below. The contact information is optional but it helps me get an idea of the code user base. The second option is by pulling the source code from GitHub. The GitHub version is generally more up to date than what is available here but may be less stable. v0.15, 11/21/2016: Initial source release of version 0.15.
v0.15, 1/12/2016: Initial binary release of version 0.15 (probably quite buggy).